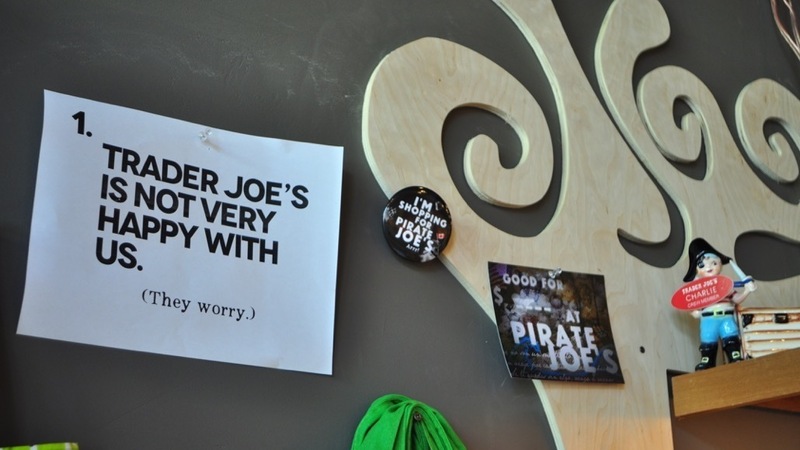 Arrgh: Pirate Joe's And Trader Joe's Are Once Again Locked In Legal Battle : The Two-Way The Canadian reseller of Trader Joe's goods was sued by the grocery chain in 2013; a U.S. district court dismissed the case. But an appellate court found that Trader Joe's had a legitimate suit. The original (P)irate Joe's was once a Romanian bakery. Then it became "Transilvania Trading," the mysteriously labeled storefront where Mike Hallatt sold Trader Joe's items to people who were in on the secret. 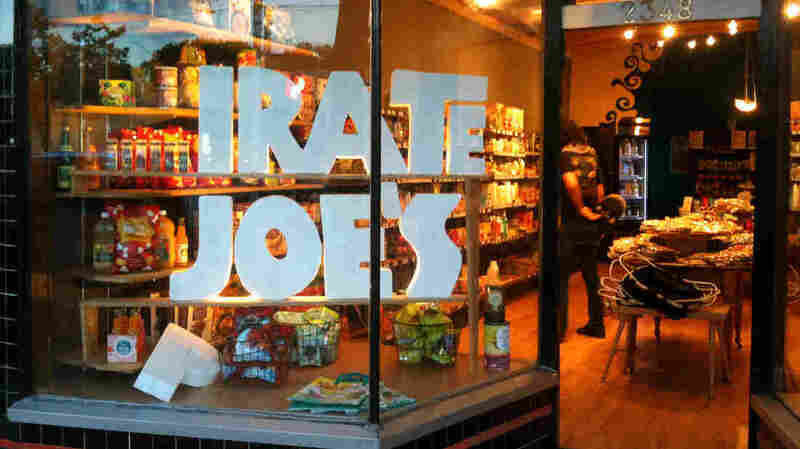 After Trader Joe's started objecting, Hallatt rebranded as Pirate Joe's. The battle of the Joes isn't over yet. On one hand, you have Trader Joe's — the U.S. grocery chain with a bit of a cult following for its quirky, exclusive products. On the other hand, you have Pirate Joe's — the Canadian "gray market" grocery shop that sells Trader Joe's goods picked up in America and trucked across the border to Vancouver. There, at a significant markup, they're sold to Trader Joe's enthusiasts who don't fancy the thought of a border-crossing grocery run. A U.S. district court dismissed the lawsuit, noting that there were no Trader Joe's open in Canada and that Pirate Joe's, for its part, didn't sell any goods in the U.S. The judge said she couldn't see any economic harm the U.S. chain could be suffering. Pirate Joe's celebrated by handing out chocolate-covered almonds. But the U.S. grocery giant appealed the dismissal, and on Friday, the 9th U.S. Circuit Court of Appeals ruled in favor of Trader and against Pirate. That doesn't mean the reseller is out of business, but does mean the case is no longer dismissed: It's back at the district court for further proceedings. The appellate court's decision focused on the fact that Trader Joe's is very particular about quality control and can't dictate how Pirate Joe's ships or stores goods. That leads to a very real risk of quality deterioration, the three-judge panel found — so the district judge shouldn't have rejected the possibility of a risk to the Trader Joe's brand. "There is nothing implausible about the concern that Trader Joe's will suffer a tarnished reputation and resultant monetary harm in the United States from contaminated goods sold in Canada," Judge Morgan Christen wrote in the decision. "Incidents of food-born illness regularly make international news, and Trader Joe's alleges that it is aware of at least one customer who became sick after consuming food sold by Pirate Joe's." That's an allegation that's strongly denied by Pirate Joe's owner Mike Hallatt, who says the alleged item was a meat product and that he never resells anything with meat in it. A Trader Joe's spokeswoman told NPR the company doesn't comment on pending litigation. As this sign inside the new Pirate Joe's suggests, the "gray market" shop makes no secret of the fact that it's not authorized by the American chain. In general, Hallatt tells NPR he finds the whole lawsuit fairly ridiculous. "For the courts to take this seriously, it's just lost on me," he says. "I buy up the stuff, retail, full monty — I own it, I get to do with it whatever I want to and I just happen to want to sell it to my friends in Canada." Hallatt hasn't backed away from his business in the years since the 2013 lawsuit dismissal. In fact, he just relocated to a new shop, now named "Super Pirate Joe's." He says he plans to add a cafe, which would sell — perhaps you guessed it — Trader Joe's food, straight out of the packaging and onto a plate. He says there's been a silver lining to the 9th Circuit decision, businesswise. "There's a lot of anxious customers now who are buying more stuff because they think maybe this is the end," he says. Hallatt, for his part, isn't worried that the end is nigh. He says he is confident that he would come out on top in a full trial. Which isn't to say he's eager about the legal slog that might be ahead of him. "Honestly, I think Trader Joe's should just open a store in Canada and put me out of my misery," he says. "People in Canada just want their stuff."